It’s late. You’re about to go to bed. Just before you shut down your computer, you notice an ad for the Greek islands. You close your eyes. You can feel the sun gently massaging your back as your feet paddle the surface of the turquoise water. All is clear sailing as you enjoy the pleasures of a crisp white wine on the deck of your dream yacht charter. What you’re probably not envisioning is getting lost at sea after fog sets you off course. Sailing is an incredible experience. You can explore places that most visitors never see, and you can take full charge over where you go. That said, you have to know what you’re doing, and you need to be prepared for the worst. Here are a few safety tips to help guide you out of the fog and back to safety. Picture this: A local fisherman has suggested a visit to a small cove reachable only by motor boat. You can dock your vessel in the local bay and it’s an easy 30 minutes due north. It’s still very early in the morning, and the fog hasn’t cleared yet. No worries – all you have to do is steer your little boat forward. Fifteen minutes pass. Everything seems alright and the water is calm, when all of a sudden you see a shape through the fog. It appears to be a cruise ship, heading right toward you at an alarming rate. You veer to the left and continue straight on, but it’s now been about 25 minutes and you still don’t see any land. The cruise ship seems to be drawing nearer. You forgot to bring a compass, but then you thought this would be pretty straightforward. More time passes and you still don’t see land. You realize that the vessel is not a cruise ship but a fishing vessel, and it isn’t on a collision course with you. The fact that it appeared so is because you’ve been steering your boat in wide circles the whole time. When the fog begins to clear, you see that, in fact, you never left the bay. It’s not the romantic morning outing you and your wife had hoped for, but at least you’re both safe. In foggy conditions other boats can appear much larger than they actually are, and you might have the illusion they’re travelling at great speeds. Visibility will be anywhere between 30 and 150 yards, and not even skilled sailors can be sure they’re going in a straight line without a compass. If you see that conditions are foggy, the best thing you can do is wait to set out until the fog clears. Barring that, use electronic navigation tools and definitely bring that compass. If you do have to lay anchor, ring a bell every five seconds to alert other vessels to your presence. Additionally, listen intently to get an idea of the whereabouts of other ships. To steer in a straight line, attach a light to a high pole or mast and point it directly ahead – the higher you can mount it the better. Throw a drogue, or anything on a line that creates resistance, over the stern and make sure the part of the rope that is in contact with the stern stays centred. This will at least help you see a straight line and you can use it as a navigational tool. Even if waters are calm, good visibility is essential. 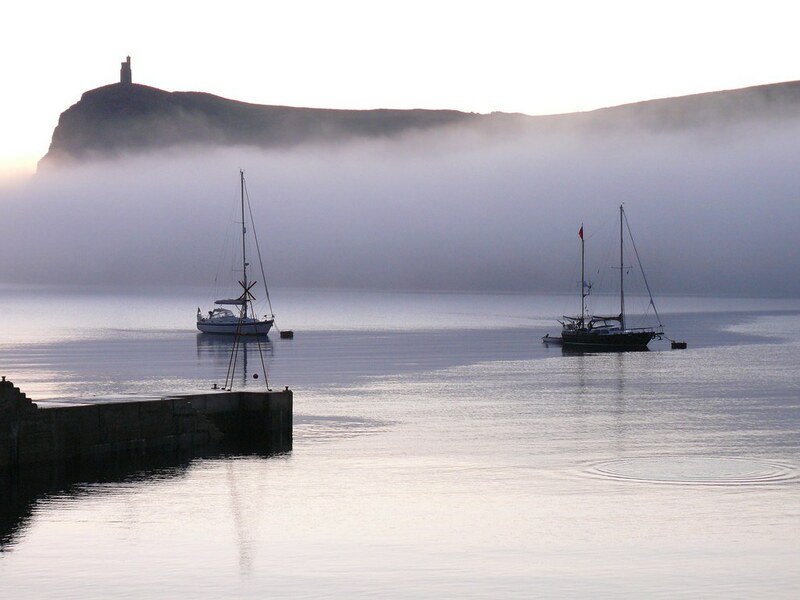 On a bareboat charter, you’re in no hurry, and if you see fog, take the morning to explore the island you’re on. Go for a hike or enjoy the catch of the day at the local tavern. Never risk getting lost at sea when you can absolutely avoid it. I like what this article mentions about stopping if conditions are foggy. It makes sense that laying an anchor when you can’t see could be helpful just to make sure you don’t hit anything or anyone. I’ll have to look into getting a good anchor for the boat as well as a bell to make sure other boats can approximate where I’d be.